Fraser Britton is a 40 year old photojournalist based in Squamish, British Columbia, Canada. Halfway between the legendary NorthShore and the Mountain sports mecca of Whistler, Fraser is loving the mountain lifestyle. 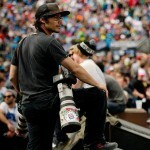 He specializes in action sports and has 20+ years experience as both a photographer and athlete. When not on location somewhere on the side of a mountain shooting MTB world cups, he regularly does contractual work for large corporate clients such as Monster Energy, RedBull and Adidas. Fraser is both a member of the Mountain Bike Press Association as well as Canon Professional Services and is supported by: Monster Energy, Five Ten Ride 100% Eyewear and Arcteryx.